Clarence struggled up the three flights of stairs to the little room In the New York slum, carrying two suitcases and his airline bag. There were no cooking facilities and no refrigerator. No matter. He had his hot plate and there was a Mom and Pop four doors down the street. After destroying the Martians in Washington, D.C., he was eager to rid New York of them. But where to start? His little TV might give him some leads. He unpacked it and plugged it in. Several hours of newscasts, soap operas and cartoons told him nothing. His window was open to the spring air and a scroungy tomcat came in from the fire escape and looked around. A good host, Clarence rummaged for something to feed it. It turned up its nose at his offering of Fritos and day-old pizza. Without a second thought, Clarence hurried down to the Mom and Pop and bought a half-gallon of milk and some Sheba. When he got back the cat was leaving but decided to stay when the can was opened. After feeding the cat, Clarence settled back to watch a movie. It was “From Here To Eternity”, starring Montgomery Clift. As the story went, Clift was a soldier stationed in Hawaii before the attack on Pearl Harbor. During the attack he was off the base and in civilian clothes. That evening he tried to get back to the base and a nervous guard, not recognizing him as a soldier, shot him. Clarence was impressed by the movie because he remembered watching a talk show where he learned Clift was a homosexual. He saw a pattern in all this and discussed it far into the night with his guides. It was pointed out to him that the movie was a message. Of course, the movie was true. His guides helped him piece the plot together. They weren’t very bright, as guides go, and Clarence knew it. But with his help, they figured it all out. Homosexuals were banned from the armed forces. Clift had infiltrated. But why would a homosexual want to be In the armed forces? Simple. He must be a Martian. If Martians could infiltrate the armed forces of the United States they could take over the world. When Clift was in civilian clothes the guard recognized him as a Martian and shot him. The guard knew what the Martians were up to. Now the news was full of homosexuals wanting to get into the military. Since Bill Clinton wanted them in he must be the Arch Martian. Later for him. But right now, Martian homosexuals were the next target. Clarence had known a homosexual in the State Hospital. He wasn’t a Martian. So not all homosexuals were Martians. He couldn’t go knocking off just any homosexual. He’d have to find where the Martian homosexuals gathered to plot and conspire and recruit those who would join the armed forces. Next morning Clarence walked down the street until he came to a newsstand. There he saw dozens of guides to the Big Apple and its many attractions. He reasoned that out-of-town Martian homosexuals, not being smarter than Humans, would need directories, the same as tourists. It became obvious to Clarence that the stand owner believed him to be a homosexual. So he wasn’t one or a Martian. He was just selling. Clarence had no idea what the reference to leather meant. But he didn’t want to take a chance on limiting his choices. “No Sir”, he said. “I just want a general directory”. “Sure, Mac”, said the stand owner. “Here’s one of the most popular, ‘Boy’s Night Out”. This is the candy store of fag rags. No offense”. Clarence handed over the price and took the magazine home. He had a New York City map and made check marks on all the addresses. Then he discussed the potential targets with his guides. Then he had to figure how to destroy the gathering places, bars, where most of the Martian homosexuals would meet. The plan was to destroy as many Martians as possible. While thinking, his eye wandered to the plastic milk carton. It was nearly empty, as the cat drank a lot and Clarence helped. With no refrigeration, it wouldn’t keep so he’d have to get another carton that afternoon. That plastic milk carton would hold a half-gallon of gasoline. With a self-detonating bomb inside, any bar would be instantly filled with glorious fire. No Martian could escape it and within seconds there would be no life left. He went downstairs and around the back to the dumpster. He rummaged around and found five empty half-gallon milk cartons. He then went to the Mom and Pop and bought two cartons of chocolate. one buttermilk and then one regular for the cat. Then he took a bus to the nearest hardware store and bought a six foot length of half-inch PVC tubing, a turkey baster, a gallon of white enamel, a two-gallon gasoline can, a half-dozen cartons of book matches and tried to buy a package of clear-plastic drinking straws. But the only ones sold to the public were the stripy kind which were hard to see through. He had lunched at a diner earlier where cheaper clear straws were free with the drink. He went back there and bought another soft drink and took about a dozen of the clear straws. When he got back to his room he put his purchases down and left with a bottle and the turkey baster. He looked for an abandoned car. This was a junky neighborhood so most of the cars parked along the littered curbs could have been abandoned. He tried door after door until one opened and he reached under the dash and unlatched the hood. He raised the hood and removed the caps from the battery. Then he stuck the turkey baster in and drew up some battery acid. He squirted it into the small bottle and after two draws he had six ounces. A few people passed by but paid him no attention. Just someone working on a car. Before he left, he put a short note under the windshield wiper, “Your battery needs acid”. Clarence was very conscientious. It was nearly dark when he got back to his room. He poured some milk for the cat and gave him some more Sheba. Then he attached an extension cord to the hot plate and put it out on the fire escape. He plugged it in and poured the battery acid in his little enameled saucepan. Next he turned the hot plate on to medium and settled down to watch TV. After an hour he checked it and a good deal of the water had boiled away. He went back to the TV and soon he smelled the fumes of sulfuric acid drifting in from the outside. He checked again and white fumes were coming up so he knew the acid was ready. He unplugged the hot plate and shut the window so no more fumes would come into the room while he waited for the hot plate to cool and the fumes to stop coming off the acid. Later, he took in the saucepan and poured the one ounce of sulfuric acid into a plastic bottle. Then he cut 40 1 1/2 inch sections from the plastic straws. Next he took the tube of GOOP left over from Washington and pushed each section 3/16 of an inch into the glob, wiped them smooth and set them aside to harden. He left them alone all night and proceeded the next morning. Now he needed a stand for them so he could prop them up while he loaded them. For this he used an envelope and a ball point pen. With the pen he punched several holes into the envelope just large enough for the straws to fit snugly. When he had several upright in the envelope he put it on some newspaper. When he put in the sulfuric acid he didn’t want to take a chance on the GOOP not having bonded properly. An acid leak in any one would be disastrous. With a medicine dropper he got for 30 cents from a drugstore he put in just a little over a half inch of sulfuric acid in each. He had also bought some cotton-tipped Q-Tips at the drugstore. 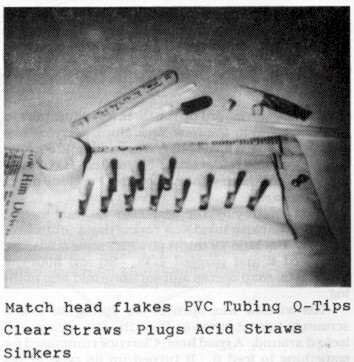 He used one to swab each tube to pick up any acid clinging to the insides above the acid at the lower end. Next, he stripped off the cotton from one end of the Q-Tip. He separated it into small bits and, with the bare end of the Q-Tip he pushed the cotton down to within an eighth of an inch above the acid. The material to be eaten through as a delay would stop at the cotton. Clarence tried many delay materials but finally settled on sawdust from dowels, sawed with his metal-cutting hacksaw. He sawed a piece of dowel sideways and downward until he had a pile of sawdust sufficient for the job. He then folded a small piece or paper and poured some sawdust into its crease. Then he would rest its end on the edge of a straw and flick the paper so the sawdust fell into the straw. When the straw was full to the top Clarence pushed another small wad of cotton in. Otherwise the sawdust would fall out among the match head flakes and cause the bomb to go off too quickly. 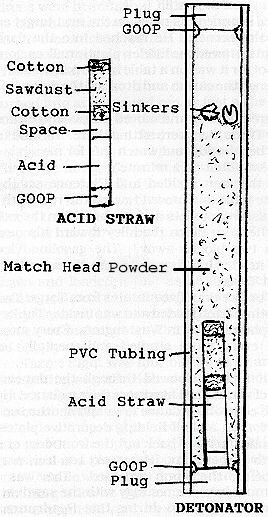 He tested several until he knew the acid would take from thirty seconds to a minute and a half to soak through the sawdust and hit the match head powder. This would allow plenty of time after setting the bomb to leave the bar. He tested them by turning them upside down in a small pile of match head powder in a small metal bottle cap and watching the second hand of his clock. To powder the heads, he cut them from the cardboard and put them in a cup. He then poured in hot water, After a few minutes, the head material had sank to the bottom. He then fished out the cardboard bits and evaporated the water in a plate, leaving the explosive. Clarence never trusted anything to chance. If a thing had to be done it had to be done right. His psychiatrist had labeled him obsessive-compulsive. He was. He rehearsed everything in his mind and then in practice, over and over again, until it was perfect. He never made a mistake. Like one adept at martial arts, he saw the result of every move before he made it. Clarence then cut ten five inch long pieces of half inch PVC tubing. Next he cut 20 1/4 inch pieces of half inch dowel. He sanded one edge of each for two reasons. The first was to make them easier to put in the tubing. The second was to have room enough between part of the plug and the tube to allow bonding between the tube, the Super-Glu and the plug. If the bonding wasn’t stronger than the tube walls, the plugs would just blow out and there would be no real explosion. Clarence put a ring of Super-Glu Gel around the middle of one end of a tube and pressed in a plug. He then turned it over and dropped in a detonator, GOOP side down. Next he filled the tube four fifths with match head flakes and dropped in two lead fishing sinkers, size 7. This was so the detonators would sink to the bottom of the cartons, effecting a greater dispersion. After completing ten detonators Clarence opened the gallon of white enamel and divided it between the ten half-gallon milk cartons. Then he took the two gallon gas can on a bus to the nearest gas station. He filled it and put it in a shopping bag before boarding the bus home. Since ten half-gallon cartons needed five gallons and the enamel would make up one gallon, he needed a refill. He went to another gas station for that one. Then he filled the ten cartons, allowing room for the detonators, capped them and shook them well. The white enamel caused the gasoline to look exactly like milk. Then he sat down with his copy of Boy’s Night Out and the city map and picked ten bars. His guides helped him to select those most likely to be Martian hangouts. Conveniently, all ten were within a few blocks of each other. He visited each and walked from the front to the rear looking for exits and logical spots for the placement of the half-gallon gas bombs. Outside of each bar he quickly sketched the interior and marked an X for the placement of the carton. At nine that evening he loaded his airline bag with five cartons and took a bus to the target area. He got off near the first bar and took out the paper sack hiding the carton. He stuffed it into a nearby trash receptacle and headed to the next bar. He set the next one down in a dark corner of a closed store’s doorway. He disposed of two others in a similar manner. The next target was too well lit outside and there were no trash receptacles. So he went inside and hid the bomb in the cleaning supply closet next to the toilets. He then went back to his room, got the other five and repeated the process. But this time he carried the ten detonators in his belt. They were stable if kept upright. Sulfuric acid is considerably thicker than water and so would not slosh in the straws. They would almost have to be on their sides for the acid to eat into the sawdust. By 10:30 that night Clarence decided to make his move. His first target seemed to be filling up. He took the milk carton in its paper sack from the trash receptacle and pushed open the bar’s door. He threaded his way to the bar and saw three empty stools. He took the middle one and sat the sack down at its side. The bartender approached and Clarence ordered a beer. After paying he sat sipping it slowly while watching the crowd behind him in the mirror on the bar wall. Like most such bars it was dimly lit, so much the better for plotting against Humanity. He listened as those around him talked. He had been told by his guides that every idea that passed between them was a plot and he wanted to hear for himself. The two men sitting a few stools down were giggling. One was saying, “That guy gets turned on watching a Preparation-H commercial”. The other laughed aloud and Clarence puzzled over what weapon against his people the letter H stood for. Just then, a friendly fellow sat down beside him and accidentally kicked over the carton of gasoline. Before Clarence could forget himself and bend over to retrieve it the man reached down and picked it up. Clarence was momentarily shaken and took the sack without speaking. ”Sorry about that”, said the man. “l didn’t see it. I hope it’s not damaged”. The man smiled and said, “No, I hate cats, but–“. The hatred Clarence showed in his face and his voice shocked the man. He arose and moved away, saying, “Pardon me for living”. Clarence just sneered into his beer and muttered, “Not for long, Martian”. After composing himself for a minute he held the sack between his knees, reached into his jacket and pulled out a detonator. He unscrewed the plastic top, turned the detonator upside down and dropped it into the carton. After quickly screwing on the lid to prevent any fumes from escaping he set the half exposed milk carton on the bar and motioned to the approaching bartender. “Hey Mister, I’m going out to spit. Don’t let anyone steal this milk. And especially my beer. I’ll be right back”. “I’ll watch it like a hawk”, said the bartender, disinterestedly as he went about his business. Clarence got off the stool and walked with measured steps to the door. When he got outside he speeded up and was a half block away when he heard a muffled explosion. The bomb had gone off, vaporizing the gasoline and filling the room with gaseous flame. Any inhalation drew living fire deep into the lungs. No one lasted more than a few seconds. Three men managed to stumble outside, torches, falling and writhing and then still. Clarence scanned his notes on the next target as he turned the corner. He reached into the dark doorway and retrieved the hidden plastic milk carton. The best spot for it was on a table in the middle of the bar. He opened the carton and dropped the detonator in. He entered the bar and moved purposely toward that table. Three men were sitting there. He said to one, “Hey, be a buddy and watch this for me while I go to the John. Just be a minute”. One of the men nodded and Clarence set the bomb on the table and moved toward the rear of the bar. He passed the toilets and pushed open the exit door. He then ran down the alley toward his next destination two blocks away. The gasoline-filled carton was nestled in a dumpster just down the alley from Target Three. It wasn’t more than five minutes from Target Two and he had the carton loaded and was inside. The key was in the planning, as in Washington. Every move calculated, every route studied and mentally rehearsed. He went in and elbowed through the dancing men, none of whom gave him more than a glance. He reached the edge of the dance area and set the sack and its carton on a shelf holding decorative plates. Then he made his way back out the front door and proceeded to Target Four. He wasn’t ten feet away this time before the bomb exploded. This was a shock. He must have been stingy with the sawdust. Oh, that must have been during that Roadrunner cartoon. He vowed never to watch TV while making bombs. When he neared the fourth target he retrieved the bomb from that dark doorway where he’d stashed it, loaded it and went in. He sat the bomb in its sack on the bar and ordered a beer, telling the bartender he’d be right back. He headed toward the toilets and again went out the back and jogged toward Target Five. Target Five was where he’d hid the bomb inside. He pushed through the now-crowded hallway leading to the toilets and opened the door to the cleaning supplies closet. There was the bomb, still In its sack. He bent his knees slightly and picked it up. The hallway was too dark and too crowded to cause anyone to notice while he opened the carton and dropped in the detonator. He was also unnoticed as he set the bomb on the table of four visiting female impersonators, the featured entertainment for that evening. They were all keening their ears to the increasing sounds of fire engines and police cars screaming by outside. Clarence pushed his way through the knot of men blocking the door and headed toward Target Six. It was in the opposite direction from where the sirens were heading but he had to hurry. There was no communication between the bars. Certainly no one in those destroyed had had time to call around. And the authorities would need time to sort things out and establish a pattern. Target Six was three blocks away. Clarence turned into an alley and ran as fast as he could. His route took him down three blocks of alleys and half a block over. He snatched the carton from its trash receptacle, loaded it and pushed open the bar’s door. There was no sign of alarm. He went in and placed the bomb on the far end of the bar counter and exited out the back. He sprinted back to the alley and ran two blocks to Target Seven. When he got to the sidewalk he could hear sirens but could see no fire engines or patrol cars. He took the bomb from the doorway three doors down and loaded it just as he approached the entrance. He went in and sat it down just inside the entryway and, since there was such a crowd and no one could make out anything in the near-darkness, he simply went back out. Target Eight was four blocks away and Clarence was getting winded. He broke into an Indian lope and got his second wind as he entered the bar. He had put the bomb in the toilet behind the towel-disposal can. He picked it up and carried it out, unnoticed. These bar patrons were pretty high and would have helped him load and place the bomb if he’d asked. When he walked out and headed to Target Nine he told his guides he was too tired to go on. They gave him a pep talk and he felt encouraged. He was advised, also, that if a bomb were left, someone might put two and two together. He answered, that the last two were in trash cans and would be carried to the dump. The guides ordered him to proceed and, like a good Earth soldier, he obeyed. Target Nine was a cinch. Its patrons were just standing around and the wall areas were crowded and there were no tables. Clarence took a chance and simply set the bomb down by a pole support in the middle of the room. As he walked out the rear exit the bomb exploded and he could feel its concussion, just in front of its flames, on his back. “That settles it”, he said to his guides, “No more TV while on duty”. Bar Ten was the last. By this time the whole area was in pandemonium. The surrounding blocks were being cordoned off and policemen on foot were herding people out of the neighborhood. Bar Ten was also a leather bar, Clarence guessed as he noticed the patrons dressed like the bikers in The Wild One, starring Marlon Brando and Mary Murphy. Mary Murphy wasn’t in sight. This one was one of the darkest so Clarence felt at ease placing the bomb at the end of the bar at the far wall. Just at that moment an excited cop opened the front door and yelled, “Everybody out. Clear this bar”. The macho, anti-cop crowd just yelled back insults. As Clarence made his way out the back he yelled, “Lousy pigs, this is our place. Leave us alone”. Clarence didn’t hear the cop scream, “Bars are being blown up all over the place . You’re going to fry” . By the time some of the louts were paying attention, the room was engulfed in flames. The cop was lucky enough to leap to the side as the rush of flame billowed out the open door. Some of the leather jacketed patrons managed to reach the door but they were soaked and burning. None lived long enough to get to the hospital. Clarence walked down the alley, relieved that his job was over. He got to the street and noticed that several bars up further were emptying. The sidewalks were filled with gawkers and the streets were crowded with fire engines, police cars and ambulances. The latter were no help to anyone. Clarence had to walk ten blocks before he could get to a street where busses were still running. It was 1:30 A.M. before he got to his room. The cat was clawing at the window and Clarence let him in and opened a can of Sheba. He watched the news reports throughout the night. There was panic among homosexuals. Carloads were leaving New York. They knew they were somehow targeted but had no idea why. The police had no leads; no suspects. The public was assured there was no connection between what had happened in Washington and New York. Moslem fundamentalists were not to blame. The ATF and FBI were combing the area and checking on every anti-homosexual group, mainly Christian fundamentalists. Nothing. Clarence knew there would be no breaks in the case. Certainly no Martians would tell and thus give themselves away. He was engaged in a war where no friends even knew there was an enemy. He, the only one fighting for them, dared not reveal himself, lest he get sent back to that place. It would be a long, hard war.